If you're looking for something a little different for your wedding or formal occasion, then try the classy and sophisticated look of the Royal Collection - white with black and silver royal border. These plastic plates for weddings look like they belong in a castle high in the hills, but they can adorn your wedding reception or anniversary party. Everyone deserves to feel like royalty and these disposable plates for weddings give you that feeling and more. 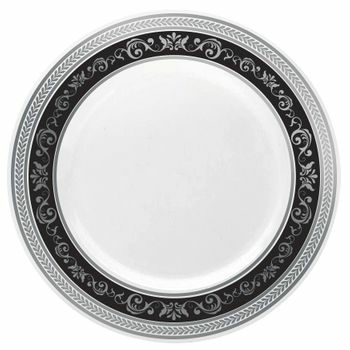 Royal Collection 10 1/4" White w/ Black and Silver Royal Border Banquet Plastic Plates 10ct. Royal Collection 9" White w/ Black and Silver Royal Border Luncheon Plastic Plates 10ct. Royal Collection 7.25" White w/ Black and Silver Royal Border Salad/Dessert Plastic Plates 10ct. Royal Collection 12oz. White w/ Black and Silver Royal Border Plastic Soup Bowls 10ct. Royal Collection 5oz. White w/ Black and Silver Royal Border Plastic Dessert Bowls 10ct. Royal Collection Clear Plastic Wine Goblet with Black and Silver Royal Border, 10 ct.